I am super excited to tell you about a fun giveaway I have for one of you lucky quilters out there! I imagine, like me, many of you have heard of the new Olfa 45mm Endurance blade that lasts up to 2x as long as a traditional blade. I have to say I have been super impressed with the Endurance blade I was sent. It cuts through fabric like butter, without being a runaway blade. It is so sharp, yet so easy to control. The center strip is flexible and bends, while the foam provides a nice non-slick effect. 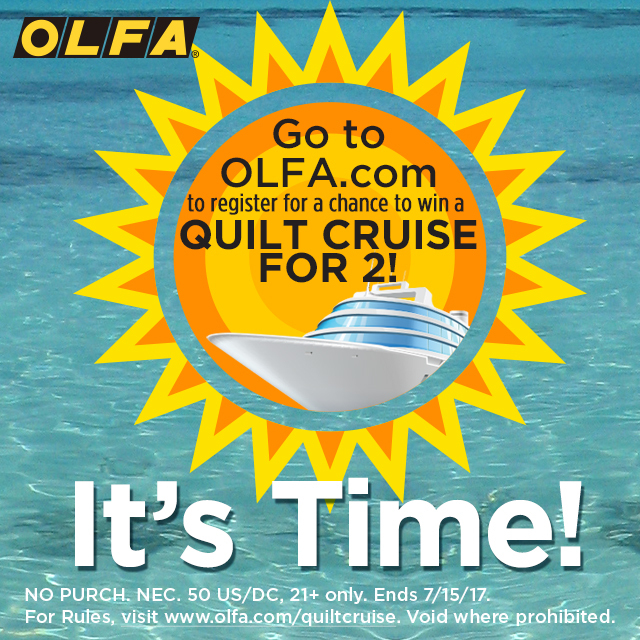 Olfa is also doing a super fun contest for a chance to win a quilting cruise for 2 on their website! You can enter daily so jump on that if you’d like a cruise for free!!! 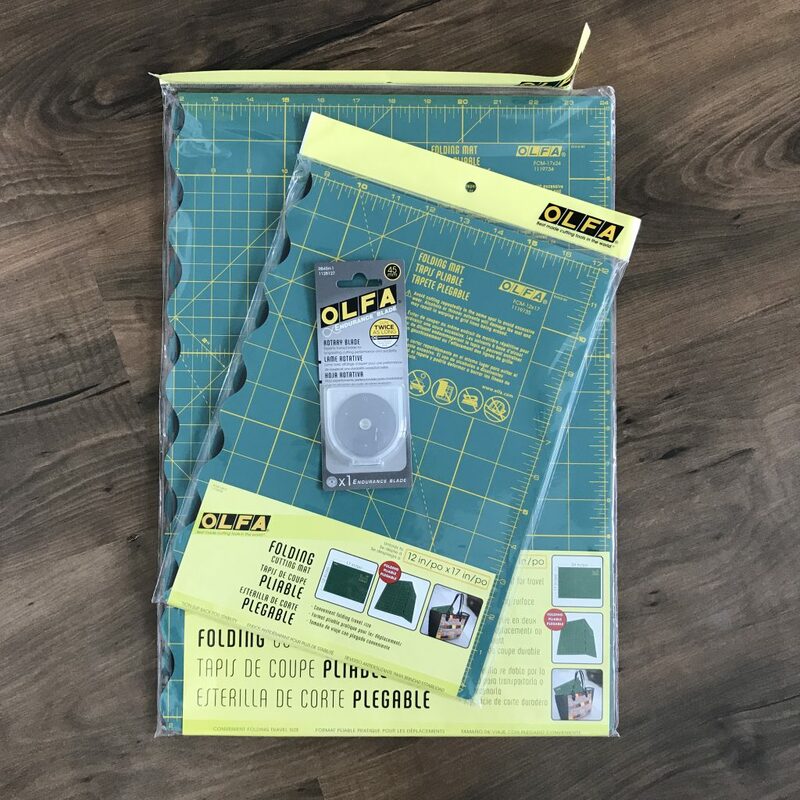 1 45mm Olfa Endurance blade, 1 45mm Olfa Splash rotary cutter in purple, and 1 12″ x 17″ folding cutting mat. To enter the giveaway, leave a comment telling me when the last time is you changed your rotary blade. I never change mine as regularly as I should, I am embarrassed to admit. Are you diligent in changing yours or do you follow my ways? (I do have to moderate comments, so don’t worry if it doesn’t show up immediately.) GIVEAWAY to US residents only and will end on Friday, June 9. Good luck!! I JUST changed the blade after making a queen quilt….for the first time ever. I change my blade when I have trouble cutting my fabric. Um, I can’t honestly remember when I last changed my blade. I have 2 rotary cutters and I just rotate between them. I kinda have a complex about changing my blades ever since I changed my blade and promptly sliced through my finger. Six stitches later, I’m pretty sure I have ptsd about new blades. But it’s time! This would be awesome to win! I’ve never changed my blade!!! Is that bad?! Maybe I’ll go do it now. Thanks for the chance to win!!! I changed my blade yesterday. But, I tend to push it as long as I can. I do like a new blade. They cut so much nicer. Would love to win. What a great giveaway. I haven’t changed my blade in about 4 weeks! Yikes. Probably a good reminder to do it now. Thanks for the chance to win. I am so so bad about changing my blades!! I only changed recently cause I was cutting fabric for a swap! 😂 And I cut on the floor too!! I changed my blade about a week ago after too many little threads that didn’t get cut on the first pass. I’ve been wondering about the new Endurance blades so thanks for the informative post! I don’t even remember when I changed my blade last- probably February?? (Of this year!) I’ve so wanted to try these endurance blades! It’s been a while and desperately needed. I tried a cheap blade and had to put the old one back on. Time for a new mat too. Thanks for the chance. I changed my blade a few weeks ago, but then ran over a pin. Blergh! I’ve been nursing it along because I was paper piecing, but I’m done now so maybe I should change it real quick… Nah, maybe tomorrow. I’m getting better at changing my blade, I think input a new one on before my last project. I also cut on the floor, but the older I get, the harder it is. I *think* I changed mine a few months ago. I can’t remember. I do know I have cut paper with it since then (bad, I know, and shame on me). It still worked ok last night when I was cutting up some linen. Maybe I’ll change it today :-). 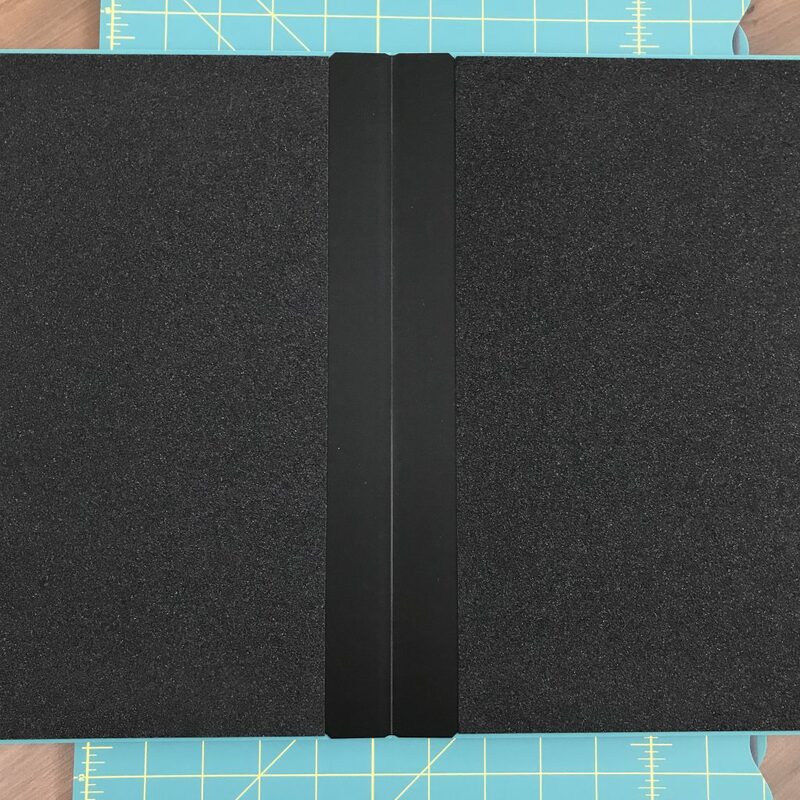 I try to change it every time I start a new project, so I am excited to try the endurance blade, and the folding mat… Its been on my list for a long time. I hardly ever change my blade! But whenever I do I wonder why I waited so long! I think I changed two of my rotary blades about a month ago. It was shortly after 100 days 100 blocks started. I can’t remember either when I changed my blades! But I use the pinking blade more than the straight edge! I love it! It stats super sharp I have cut through my tablecloth a couple of times! Lol! I fight to the death with a dull blade trying to be cheap. Then get ticked off when it doesn’t cut well. But still use it until I get really mad it’s not working properly, THEN I get a new blade. So smart. Also, I feel like there should be a simple and cheap way to sharpen the blades so they last longer. So, I guess for now I need a double life span blade. Thanks for the chance! I keep more than one rotary cutter around and I might just swear a bit when I accidentally pick up the one with the worn out blade that doesn’t make clean cuts in my fabric. Haha. I always make sure I have a fresh blade for trimming HST and FG though. Otherwise, its a disaster! I change when the blade starts to leave uncut sections. I changed just a week or so ago and on the first day of the cutting, I ran over the tip of a pin, so I was back where I started. Boy, was I mad. I can’t remember when I last changed my blade. We’ve been in the midst of a move, but I always put a new one in for a new quilt top cut out session. It has been six months or more since I changed my olfa blade. But I don’t use it as often as I would like. I change my blade when I run into trouble! I just changed mine about a month ago after a year… It made such a difference! Hmmm I’m ashamed to admit that I don’t know when I last had a new blade. 😬😂 I mean, it’s still cutting, soooooo…? 😃👍 But I’ve been thinking it’s about time to do some routine maintenance on my machine, my sewing supplies / accessories, and my fabric stash. A new rotary blade would definitely be part of that! Thanks for the lovely giveaway! 2 plus months ago–it is on my to do list to change my blade this week. I changed my blade about three weeks ago. I LOVE ❤️ having a new blade in my cutter, but I try to make the old one last as long as possible! I would ❤️ to try the new endurance cutting blade, and the traveling mat would be awesome!!! So… months ago my husband used my rotary cutter to create a prototype game board and bought me replacement blades… and I STILL haven’t changed them! Yikes! But no shame! I definitely don’t change mine as often as I should. My current one has a little skip and I go back over with scissors to separate each layer. Awful I know but I hate paying for blades! I think I changed it last 6 months ago or more… The endurance sounds ideal! I use my blade until I just can’t stand it anymore! I must get knicks on the blade and it skips sections. After I change it, I wonder why I waited so long! The last time I changed my rotary blade was right before I cut off part of my finger! Yuck! But at least it made a very clean and sanitary cut that healed well. LOL! I changed my blade last week. Besides cutting out a full size top, I have been cutting my scraps into 2.5″ and 5″ squares to help organize the chaos. I really can’t remember when I last changed my blade, I’m sure it’s due! I hate doing all the cutting so I’m mid way through cutting multiple projects. I’m pretty bad about it too. Probably switch it very few months. Basically until it annoys me that I have to go back and get the little sections that don’t get cut. I am so bad about changing my blade. It’s been at least 3 months since I’ve changed it. Ugh! I changed mine about two months ago. Guess I should change it now!!! I change my blade when it doesn’t cut right. Certainly not as often as recommended. Would love to try the endurance blade, and the folding mat would be awesome! Thanks for the opportunity to win them! Hmmm. I can’t remember. It’s been a couple of months… I usually wait way too long & then can’t believe how nice a new blade is. Hey. I actually changed mine tonight after cutting out a few projects this weekend. I have also been eyeing that endurance blade. I love love love your bow tie quilt. It really is beautiful. I change mine when I have to press down really hard as I’m cutting. Or when I have to cut several times in the same place. So the last time was 3 months ago. Just changed my in February. It’s always the last thing I think about changing, but man, it makes such a difference! Yikes….mine is still skipping pieces and I haven’t changed it. I’d guess it has been at least 6 months?!?! I keep all my dull blades and needles in an old Olfa blade container and use it as my ‘sharps’ container. I’m so paranoid I’m going to slice or stab myself when I’m taking out the trash! I just changed mine again-bought cheap last time. It is true you get what you pay for, plan is to finish out the cheapies then try Endurance, hint hint. Thanks for the great giveaway! I bought a cheap pack from amazon and I’ve been having so many problems with my rotary cutter — duuuh — I feel as if every blade I got had some defect so I’ve been suffering through it. I think the last time I changed my blade was in December. I honestly just changed my blade two days ago, because it had gone on using a dull blade long enough! Why, oh why, do we wait so long?